Redondancy of supply is often a must ; protection coordination is not easy to master : case of parallel MV/LV transformers. constraints on physical size of the transformers. To ensure the maximal level of continuity of supply a particular attention shall be attach to LV protection coordination at the transformer level. * CB3 and CB1 should operate to eliminate the short circuit current and CB2 should still closed. * the solution consists in using chronometric cascading between CB3 and CB1/CB2. The proposed solution consists in setting CB1 and CB2 short delay to an upper value than CB3 short delay. * only CB4 should operate. The problem is that in some case the rating of CB4 may be greater or close to the rating of CB1 and CB2. 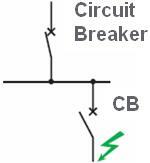 Despite breaker selectivity table given by circuit breaker manufacturers gives no solution, breaker selectivity may be possible thanks to the fact that CB1 and CB2 see half of the short circuit current compared to CB4. or copy this trackback: http://engineering.electrical-equipment.org/electrical-distribution/parallel-transformer.html/trackback from your own site. This is a system with two different Electric supply circuit with common load which is in CB4, in this case, one is the Normal source of power and the other in emergency power like Standby Generator. If both are supplying the load in parallel operation, the system must be properly synchronize. If CB3 is the tie breaker, and will operate only when CB! has no loss power, then CB3 must be designed with mechanical and electrical interlocking system to avoid motorization of the smaller power supply and for safety purposes. This is of course the case parallel transformers fed by a common MV power supply. 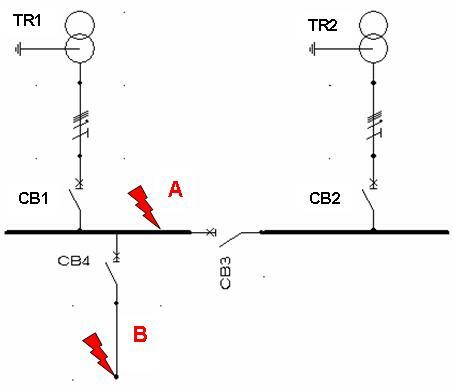 The purpose is here to define a way to set a reliable discrimination between CB1, CB2 and CB3 in case of fault in A in ordre to keep TR2 and its dowstream feeder under voltage. They have a common power supply and not different. I can suggest then that certain faults can be avoided by improving power quality. PLUS IT CAN SAVE ENRGEY. Try the ECTROFLOW SYSTEM. the power quality solutions can balance the three phase load automatically, it can stabilize voltage, increase power factor up to 100%, mitigate Harmonics to non destructive level, can supply the loss phase in case of single phasing fault, it has 10 features. your blog was added in our blog. Thanks. My pleasure that my Weblog now added. Let us share and exchange our unique experiences. Wonderfull blog for electrical engineer and for electricians ! I have a question : Where I can get gratis download soft for Electrical Cad 2004 ? coming back to your request can you be a little bit accurate, what are you looking for exactly ? The above application for two different load from two different sources through 2 CBs( CB1+CB2 ) and another CBs that is called CB Coupler ( CB3 ) . How green are Compact Fluorescent Lights (CFLs)?